Joanne Valiukas is the author of Dannan Frost Falls From Grace. In this sweeping paranormal romance, Joanne combines myth and legend to craft the the love story of Danann and Seth. I had the opportunity to ask her some questions for my blog today, I think you will find her answer interesting! 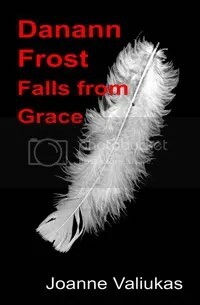 Joanne is genrously offering a signed print copy of Danann Frost Falls From Grace. Details on how to enter are at the end of this post! Joanne: The inspiration for writing and creating the world in which Danann exists was music. It was Frankie Goes to Hollywood’s The Power of love and the lyrics I’ll protect you from the hooded claw, keep the vampires from your door. My main series is called collectively ‘The Ancient Bloods’ and Danann’s story is a companion tale that exists in the same world with some crossover. I wrote the 5 Ancient Blood books in 99 straight days and then began editing but I quickly realised that I needed to continue creating, so I conceived Danann’s story whilst doing research for the Ancient Bloods. I stumbled across Celtic Mythology and a story about how the god Manannan Mac Lir’s second wife cursed his children to be swans for 900 years. When I read that, I imagined a vampire, mistaking an Angel for a cursed Celtic goddess and so both Danann, my angel and Seth, my vampire prince were born. Q: How long did it take you to write Danann Frost Falls from Grace? Joanne: I wrote Danann Frost Falls from Grace in 19 days straight, then I took a week off and wrote the sequel, Danann Frost Embraces the Darkness in 21. Q: Ireland is an unusual location for the birth of the vampire race. What prompted the choice of locale? Joanne: I really love this question because it indicates to me that you’ve really been thinking about what I wrote; for a writer, that is a great compliment. The vampire race did not begin in Ireland, it actually began elsewhere. This is all explained in full in the Ancient Blood stories but they are not yet published. When the vampires migrated to Ireland, they were tired of their existence and decided to rest for a time. The Celts believed them to be the fey, the Tuatha de Danann or the peoples of the Goddess Danu and they made an arrangement with them. They offered them the Sidhe mounds to live in and sacrifices were given to them because the victims believed they would travel with the Fey to Tir Na nOg or the Land of the Ever Young. They mistook the vampires for something other than what they were and they created the mythology around them. Seth actually gives Danann her name because he believes that she is a cursed Celtic Goddess. Q: Tell us what makes the vampire lore in Danann Frost unique. Joanne: In my mythology, there are living and undead vampires and the undead shape-shift at the full moon to become whatever animal their sire was. My living vampires can have children but not the undead. My vampires do not need to be gluttonous, though they do feed for pleasure and they are very, very dangerous; but so too can they be emotional. My vampires have very human emotions, they are just much more intense. Q: What do you think is Danann’s biggest mistake? Joanne: Danann makes the same mistakes that most of us do but her biggest mistake is stripping her life of anything good and forgetting to enjoy the little things as a way of surviving. Q: Tell us about Seth. What are his best traits? Joanne: Seth reminds Danann what it is to live, how the little things in an existence are the very things that make that existence worthwhile. Danann had stopped eating and sleeping…tasting coffee even. It is not until he forces her to do these things that she remembers how much she actually enjoyed doing them. Another wonderful trait of Seth’s is that though he is trapped in time emotionally and mentally, to some degree, he insists that he and his people are able to fit in with humans and their changing natures and times. Q: Danann Frost Falls From Grace is very much a love story, what point do you think is the most romantic? Joanne: It would have to be the part where they first see each other again after 200 years. She thinks that she is asleep and is dreaming of him, so her inhibitions are down and she does not hesitate in revealing her feelings to him. He on the other hand is so frightened, big bad scary vampire that he is, because he is so vulnerable. He cannot help but want her, despite his belief in her betrayal. There is a true yearning to the whole scene, I think. Q: Can you tell us anything about the sequel, Danann Frost Embraces the Darkness ? Joanne: There are a few little hints on my facebook page anyway, so I am happy to share these. In the sequel, Danann is forced to get married and she vows revenge and the way she goes about this has to be about the most enjoyable thing that I’ve ever written. We see more of the women everyone seems to love to hate…Seth’s mother and sister. We find out more about Lucifer and his fall from Grace and naturally, we find out whether or not Seth and Danann are able to overcome the obstacles in their path or if Danann finds love in the arms of another. My website, joannevaliukas.com, has an excerpt from the second book that will shock, surprise and frustrate fans of the first book with its implications. The sequel will make you laugh, it will make you cry and there are so many twists that you will never be able to predict where the story goes or how everything turns out. There are two things that I will say however, I like to finish a story where everyone gets what they deserve, good, bad or otherwise and the other thing I will say is…trust me. I will give you a sequel that satisfies beyond all expectations. Q: Despite the popularity of UF/PNR Australian authors of those genres are rare. Why do you think that is? Joanne: I think that we Aussies are wonderfully talented but in comparison to many other nations, our population is considerably lower. I think that we probably have just as many talented writers per capita, it just may not seem that way. That being said, it is so difficult to get someone in the publishing industry to talk to, let alone agree to reading a manuscript. You could be the best writer in the world but without luck…you have no chance of being published. You just need that one brave person to take a chance on you. It is actually that brave person that I am looking for. Q: What part of writing do you enjoy the most? Joanne: The part that I love the most would have to be my relationship with the characters. There is really only one section (admittedly a rather large section) of one book, out of all seven that I have written, that is not character driven. Because to me, it feels as though they are telling their stories to me, I know them so well and it really does feel like I am having real relationships with them. It makes the writing so intense and so emotional that it does not seem like hard work, even though it absolutely is. Q: What did you have for breakfast this morning? Joanne: I don’t often have breakfast but when I do, it is usually a chocolate croissant. Q: Where is your ideal holiday location? Joanne: It would have to be a tie between travelling around New Zealand, particularly the South Island, Te Anau, Franz Josef glacier, Milford Sound and Fiordland. The other place would be Canada, which included an Alaskan cruise. Both of these locations would be transcendent, not to mention the fact that I have used both of these locations in books. Joanne: I am not reading just now because I am actually writing again. However, I was reading Sherrilyn Kenyon’s Dark Hunter books prior to having started my new book and I enjoyed them all very much, particularly Acheron’s tale. I am a 40 year old wife and mother, having 2 children, a boy aged 10 and a girl, aged 8. I began writing at age 39, during February of 2009. I literally sat down at my computer one day and began writing. I wrote for 99 days straight, all day every day and then came out of that with 5 rather large books that I lovingly call the ‘Ancient Blood’ Books. I began editing and realised very quickly that I had to continue ‘creating’. By that I mean, creating more characters and storyline. As a result, I began writing Danann Frost Falls from Grace. This was accomplished in 19 days, after which I took a week off, then I wrote the sequel Danann Frost Embraces the Darkness in 21 days. They are a companion tale to the Ancient Blood books, set in the same universe with some crossover. My life prior to writing Danann’s story did not include writing at all. In fact I hated writing at school, though I always achieved good marks. I spent my whole working life in the Banking Industry before leaving to begin my family. I did not realise what was missing in my life and indeed, writing never occurred to me but as I sat at my computer one day listening to music; my mind literally exploded. I was listening to Frankie Goes To Hollywood’s the Power of Love. The lyrics I’ll protect you from the hooded claw, keep the vampire’s from your door. When the chips are down, I’ll be around with my undying, death-defying love for you. Instantly, my mind was flooded with ideas and though the story did not go the way I expected, it was these lyrics that sparked my imagination to a point where I literally just starting typing. The characters helped to drive the story though they would cause me great stress by often refusing to do what I wanted them to. In the end, I learned to embrace their opinions because I had given them life…I should be listening to them. This way of writing for me, produced something that has very real, very flawed characters that go adventuring into very deep plot lines. things and that is a theme in my books. Always remember the little things that makes life worth living. Which three angels pass judgement on Danann? You can find the answer in the Free Sample (pdf) available on Joanne’s website. Where do Ash and Danann live? Include your answer/s, your name, email address and country in your comment for your chance to win! Danann Frost Falls from Grace is now available for the Kindle, as well as Adobe Digital Editions ePub from Lulu, Kobo Books, Borders Australia, Angus & Robertson and undoubtedly many other places that have branded ebookshops provided by Kobo. Also iTunes/iBooks for the iPhone and iPad and iPod Touch. The 3 angels that pass judgement on Danann are Gabriel, Michael and Uriel. Thanks for a great interview … this sounds really interesting … will definately have to read this. The angels that pass judgement are Gabriel, Michael, and Uriel. The three angels that pass judgement are Michael, Gabriel, and Uriel. Answer :Gabriel, Uriel and Michael. Gabrielle, Uriel, and Michael. are the three angels. Damien and Ash live in south Yarra. 🙂 Hot irish vampires …. :O lol loved the interview sounds like a great book id love to read ,,.